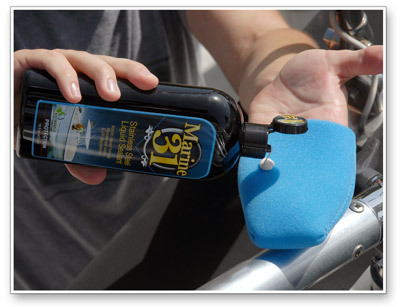 Marine 31 Stainless Steel Liquid Sealant 32 oz. - ON SALE! Marine 31 Stainless Steel Liquid Sealant is a durable, acrylic based boat metal sealant that seals and protects stainless steel, aluminum and chrome surfaces. Treated surfaces will be well-protected against UV rays, salt degradation, bird droppings and other common contaminants that plague a boat�s metal surfaces from every day use. Designed to be applied to surfaces that are free of oxidation and rust, Marine 31 Stainless Steel Liquid Sealant creates a highly reflective, protective coating that lasts up to 6 months! 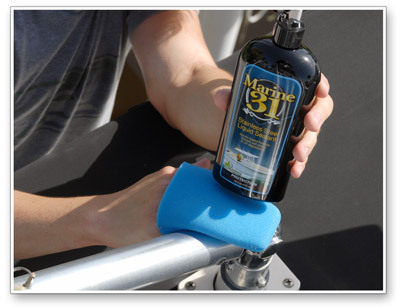 Marine 31 Stainless Steel Liquid Sealant is cheap insurance for protecting your boat�s stainless steel, aluminum and chrome surfaces. Stainless steel is typically difficult to polish, aluminum naturally oxidizes and chrome is very expensive to replace, all the more reason to protect your boat�s metal surfaces with Marine 31 Stainless Steel Liquid Sealant! It�s only an added bonus that Marine 31 Stainless Steel Liquid Sealant is incredibly easy to apply and remove. Marine 31 Stainless Steel Liquid Sealant imparts a durable, clear protective coating that withstands the elements for up to 6 months. Water will bead up and roll off and removing bird droppings will be effortless. What�s more, treated metal surfaces will remain noticeably cleaner in between washes. What more could you ask for in a boat metal sealant?